For this research point I chose a textile piece that I have owned now for more than 20 years. It is a Kalaga I bought when I lived in Singapore but found it when holidaying in Thailand and then had framed in Singapore. It has always hung in my living room and has travelled with me to my homes in Singapore, back to Thailand then England and now hangs in my living room in Tokyo. 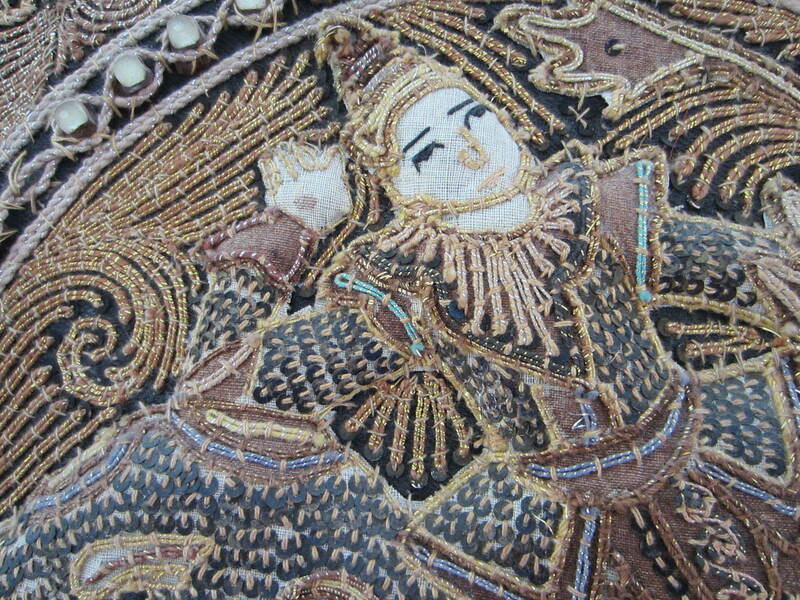 ‘Kalaga’ is the traditional name for an embroidered tapestry made in Myanmar but usually sold in Thailand. The tradition goes back over 100 years but is now produced as a purely decorative item, mainly for export or tourist purchase. When I bought my kalaga, they were not commonly available in the West and over the years it has been greatly admired. The actual piece measures approximately 50cm x 50cm and consists of a piece of heavily embroidered linen or cotton, bordered by burgundy silk. 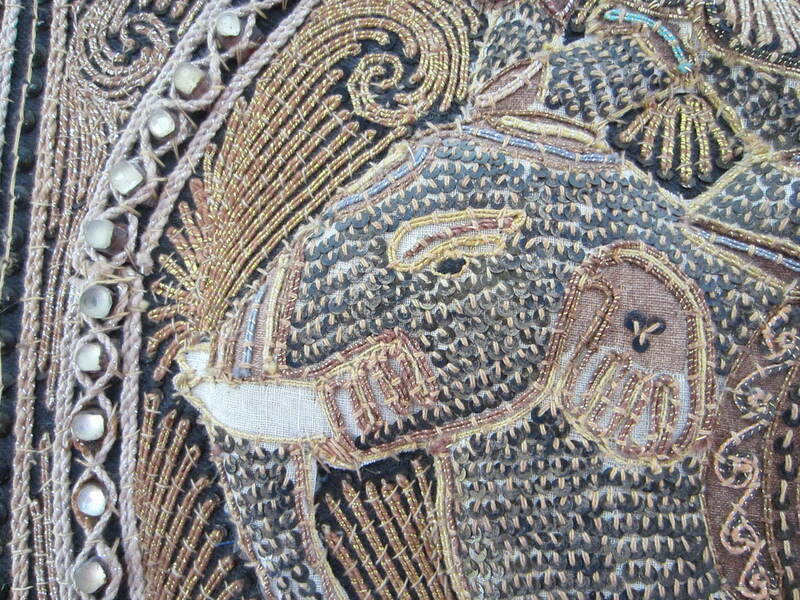 The central image is of an elephant and rider, which is padded and also embroidered with metallic threads, glass beads and sequins. 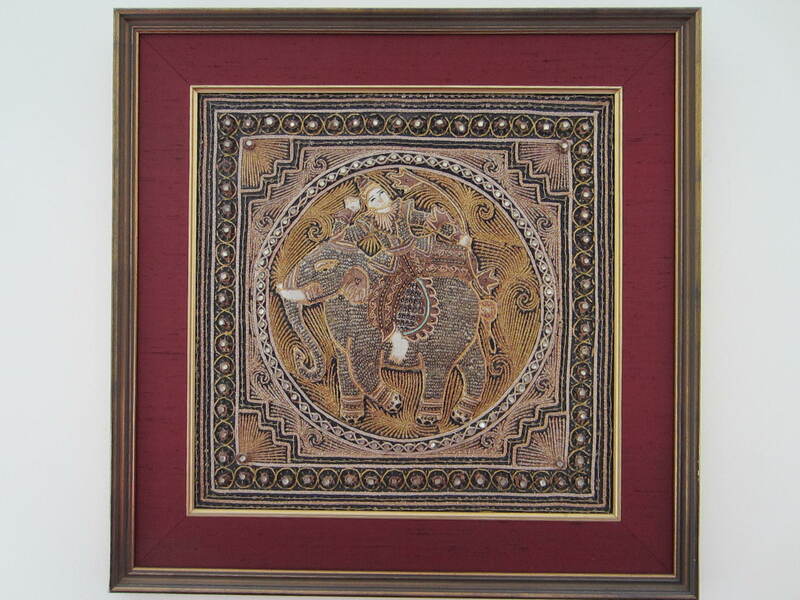 I had the piece framed with another silk border and an open gold frame. I decided not to have a glass frame so that the embroidery and texture can be better appreciated. I believe that the kalaga was fairly new when purchased so is at least 20 years old now. They were made by villagers by hand, as evidenced by the hand stitching and intricate beading. I believe that they originally came from the Mandalay region of Myanmar. Judging by the very low price paid and the considerable amount of hand-stitching involved in making this piece, I can only assume that the makers are on a very low wage and hope that their working conditions are good. 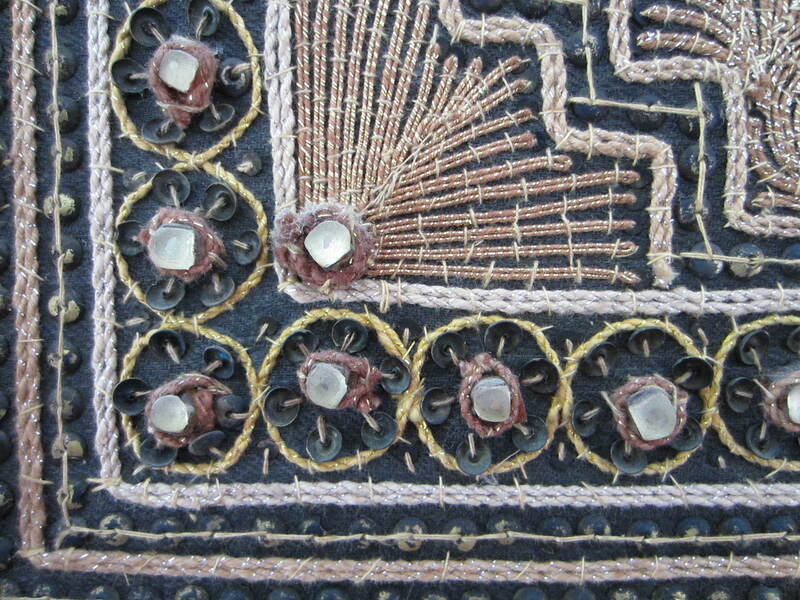 I particularly like the colours and shiny detailed embroidery. It is not perfect as over the years some of the beads have dropped off and threads have undone. The fabric has also faded over time and I find that this adds to the character of the piece. This piece looks good displayed in any room and looks equally impressive alongside antique furniture as well as ethnic and contemporary furnishings. My children have grown-up with this piece and I hope that it will always remain in the family as it conveys our love of handcrafted items, mixed-media and travel.